President Rivlin sells all of the chametz in his residence to Rabbi Shlomo Amar, Jerusalem’s Chief Sephardic Rabbi, ahead of Passover. 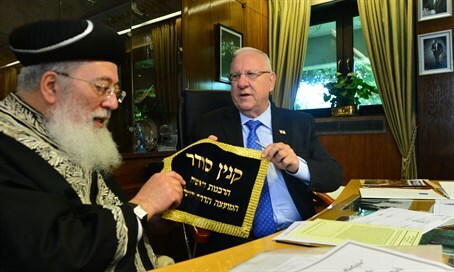 In preparation for the upcoming Passover holiday, President Reuven Rivlin on Sunday carried out the ritual selling of the chametz (leavened foods that are forbidden on the Jewish holiday) with Sephardic Chief Rabbi of Jerusalem Rabbi Shlomo Amar. In the brief ceremony, the President appointed Rabbi Amar to act as an emissary of the President in selling all goods not suitable for Passover to a non-Jewish person before the beginning of the festival. The Rabbi spoke with the president about the laws of the sale of chametz and the reasons behind them, and then the president signed a bill officially selling all the chametz in his residence, office and private home. The President was joined by Director General of the President’s Office, Harel Tobi, who appointed Chief Rabbi Amar to sell all chametz which may be found in the offices of the President, and in the halls and meeting rooms.